I seldom ask for signatures from professional bike riders, but in 2012 I did. I took a Colorado cycling jersey with me to the inaugural USA Pro Challenge in Colorado and gathered signatures (when I was not being Media, of course). What resulted was the jersey above. Who signed the jersey? I can hardly remember now. I think that is Andy Schleck's signature to the far right, Jeremy Powers signed the right sleeve, Oscar Seville drew a little bicycle for me (center-right), I think that is Taylor Phinney in the center, George Hincapie is on here somewhere, so is Laurens tem Dan and Jens Voigt. The most clear signature is on the back of the jersey (below) and is that of Cadel Evans. Also I recognize Tyler Farrar's signature above Cadel's because he has the strong T. Other than that I would have to research signatures and race rosters to know who is who on my prized possession. I can only make out Cadel Evans' signature on the back of the jersey. There was a time when riders would work to perfect their signatures, in fact extra points or cash prizes were awarded for penmanship. The tradition of a well-crafted signature held for some time. In 2012 I also took a small Colorado state flag with me to Interbike in Las Vegas to collect signatures. I had heard Mario Cipollini and Miguel Indurain would be attending the bike show. This is Mario Cipollini's signature. I liked that he signed in the middle of the yellow sun. This is Miguel Indurain's signature. I think this is so cool! The sign-in sheet is a tradition in the sport of cycling. Often used to insure that riders did not skip over the route by taking shortcuts, riders were required to sign-in at various points along the stage. Today they of course only sign-in at the start, but I come up blank when I try to think of any other sport which has this same tradition. In the historical book of the Tour de France titled The Tour de France, author Christopher S. Thompson writes, "The newspaper L'Auto had an obsession with assessing the beauty and elegance reflected in the racer's handwriting at the check-point sign-in sheets. A regular feature in L'Auto from the very first tour, Racers' signatures often received prominent coverage. Racers photographs were often accompanied by their autographs, suggesting that a racer's signature was as representative of him as his face." I am very fond of the tradition of signing autographs. 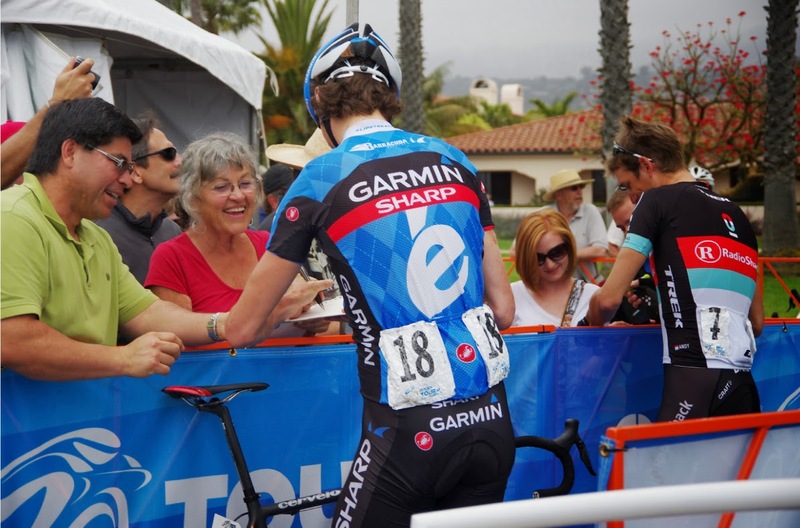 Here Johan Vansummeren and Andy Schleck offer their signature to fans in California at the Amgen Tour of California in 2013. Johan Vansummeren and Andy Schleck offer autographs under the palm trees of southern California. All photos in this post by Karen Rakestraw at Pedal Dancer® .